ARRT's annual meeting will be held on Thursday, June 19 in the Mayor's Meeting Room on the top floor of Marlborough City Hall. Other meeting topics will include a town-by-town update and activity planning for the next few months. Come at 6:30 p.m. for socializing and refreshments. The meeting will start at 7 p.m. Hope to see you there. On July 19, ARRT will be at the Community Table at the Maynard Community Farmers' Market. Volunteers will be answering questions about the latest trail happenings as well as selling the newly designed ARRT t-shirts. The Maynard Farmers' Market runs Saturdays 9 a.m. - noon in the Mill Pond Parking Lot at Clock Tower Place on Main Street. Thanks to the efforts of many volunteers, ARRT held two successful cleanups in May. Equipped with garden tools, saws and trash bags, volunteers cleared 6-feet wide, 1000 feet sections in Marlborough and Maynard by cutting and removing brush and saplings, and picking up trash. 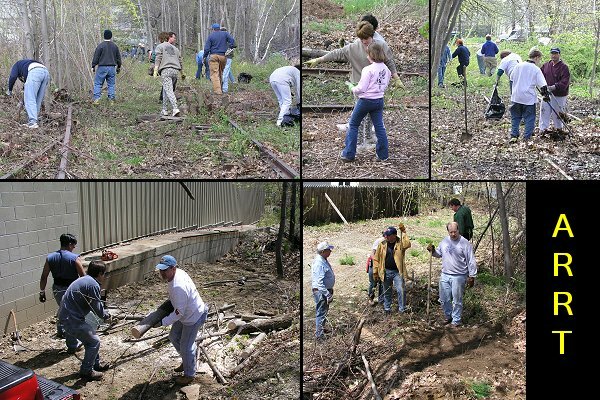 On May 3, 27 volunteers turned out in Marlborough in perfect weather to clear from the Lincoln Street trailhead to Hudson Street. The cleanup was jointly sponsored by ARRT and Project Hope. Temporary trail markers will go up on this section. 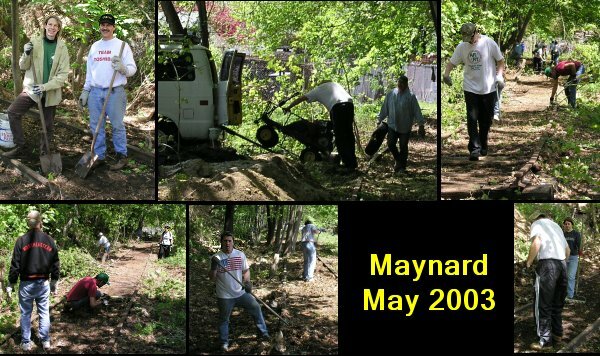 Fifteen volunteers turned out in Maynard on May 10 to clear the portion of the trail north of downtown that starts at the MapleBrook Park garden on Summer Street and continues up to Acton Street. Thanks to a woodchip donation from Assabet Valley Tree and Landscape, chips have been spread along 1/3 of this path. Plans are to continue this project this summer, contact David Mark at 978-897-5853 if you would like to help. These two sections of trail are now both walkable paths. Be sure to check them out. Thanks again to all the volunteers who participated. The opening of the construction bids to pave a 4.8 mile portion of the trail in Marlborough and Hudson has been postponed by MassHighway until July 1. The project will include a 1 1/4 mile section in Marlborough, from Lincoln Street to Fairbanks Blvd. The other section is in Hudson from the Rte. 290 connector underpass to Wilkins Street/ Rte. 62 and includes 3 parking lots: Washington, Main and Wilkins streets. Check the ARRT web site for the latest developments. In June, ARRT volunteers will construct the first of three information kiosks being built with the $5000 donation received from Intel Corporation. The design mimics an old railway station and you can view the plans on the ARRT web site. The kiosks will be built offsite in sections and then installed at their locations. The first kiosk will be installed at the Fitchburg Street crossing in Marlborough. 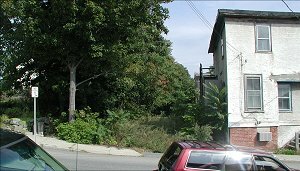 April 25, 2003: The long abandoned Cocco building at the corner of Summer and Nason streets in Maynard was torn down, to make way for the new MacDonald Development 22-unit apartment building. The building will be located next to the rail trail path, which is on the left side of each of the above photos. With the ARRT's approval, the town sold a small slice of the old RR right-of-way to the builder in 2002, so that they would have enough room for the required fire lane. 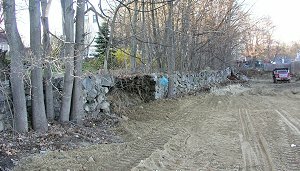 The rail trail and the apartment building have a 175-foot long granite block wall between them, that is to be protected and preserved by the town.